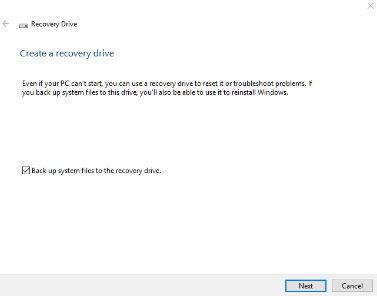 In the box or circle next to the type “create recovery disk”. The following window then opens. Place a USB pen drive into a USB slot on your computer of at least 8GB or size specified in the above window. Click “Next” leaving the backup system files… checked. Select the USB drive and click “Next”. WARNING everything on the USB drive will be deleted. This process may take quite a long time to complete. Once complete take the pen drive and keep it in a safe place. Creating a system image is a great way to recover your computer if you have a problem with it. The image is best created on and external portable drive. You can use a part of the internal drive of the computer but if this is the same physical drive as the operating system and where all your files are stored, if the drive develops a fault you risk not being able to restore from the image. Plug in and connect your external drive to your computer. To create the image in the box next to the start button type “Control Panel” and press enter, then select “Backup and Restore”. If you don’t see this change the display format from the drop down box in the top right of the window to large icons. In the backup and restore window click “create a system image”, then point to the external hard drive. Now click “Start Backup”. You should also create a system repair disc on a DVD. Once you have put a DVD in the drive click “Yes”. When complete remove DVD and disconnect the system image drive and store in a safe place.